Culver’s Day of Giving – Thanks! Many thanks to all the Culver’s who participated in “Day of Giving” it was a huge success and all the money raised goes to help victims of the recent flooding in the Midwest. 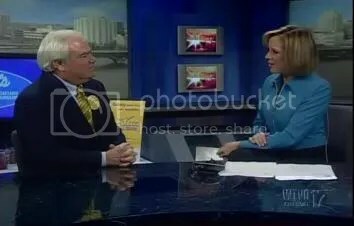 At the Culver’s on North Main Paul Youngblood of WTVO/FOX39 did the weather and we talked about what’s in a comfort and clean-up kits. 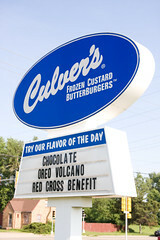 Culver’s Restaurants are banding together again for the benefit of the American Red Cross’ Disaster Relief Fund. Culver’s restaurants of the Rock River Valley are among more than 370 Culver’s restaurants donating 10 percent of their respective sales on Tuesday, July 1 to their local participating American Red Cross chapter. The Rock River Chapter will then use 100 percent of the funds to provide immediate relief to victims of disasters such as the recent Midwestern Floods. Guests can enhance the total Red Cross contribution by giving personal donations in canisters available at stores. Culver’s has one again stepped up to the plate and is having another “Culver’s Day of Giving” on July 1, 2008 and the American Red Cross gets 10% of your purchase. So, mark you calendars to eat a meal or two at Culver’s on July 1st. Want a FREE button for Rock’n for the RED & a scoop of custard from Culver’s? First 10 people who come to our chapter house TODAY get a coupon for a free button to Rock’n for the RED & a scoop of custard from Culver’s! Just click the red camera button on the top right-hand side of page to watch the story when you get to WREX’s page. Restaurant Helps Raise Money for Red Cross – WREX Channel 13 Ryan Cummings. It features Jason Broaddus – Red Cross Marketing/Development Specialist and Stephanie Koch – Culver’s Owner/Operator.